Lineage, in the Buddhist tradition, refers to a line of transmission that has been passed down from teacher to student in an unbroken way, from the time of the Buddha until this present time. Lineage not only refers to a continuum of teachings and practice instructions, but also how the teachings come to life in those who practice them. An emphasis on lineage ensures that the spirit, integrity, and vibrancy of the Buddha’s wisdom is not watered down or misunderstood. In each step forward, the sincere longing of the student inspires the teacher to open the door to further instructions. In this natural process a relationship of mutual understanding forms, which provides an environment of integrity, clarity, and trust for students traveling the path. Essentially, Buddhist lineages have maintained their juice and continuity because an unbroken continuum of inspired practitioners have been driven by a fierce allegiance to their own spiritual awakening. As the Buddha said: “You are your own master.” In other words, although we rely upon the teacher for instructions and transmission, we must take responsibility for our own spiritual development. For me, this is an empowering statement and something for us all to deeply consider as we enter into any lineage of wisdom. My teacher, Dzigar Kongtrul Rinpoche, descends from a pure lineage of the Dzogpa Chenpo Longchen Nyingtik tradition of Tibetan Buddhism. Born into a dharma family in Northern India, his father was the third incarnation of the great master, Chogyur Lingpa, while Rinpoche’s first teacher, his mother, was a great and renowned practitioner, completing thirteen years of solitary retreat before she married. At the age of nine, Dilgo Khyentse Rinpoche and the 16th Karmapa recognized Rinpoche as a reincarnation of Jamgon Kongtrul Lodro Thaye, one of the great founders of the Rime or non-sectarian movement, which did so much to preserve and harmonize all schools of Tibetan Buddhism in the nineteenth century. Raised in a monastic environment, Rinpoche received extensive training in all aspects of Buddhist doctrine. In particular he received the teachings of the Nyingma (old school) lineage from his root teacher, Dilgo Khyentse Rinpoche. Rinpoche also studied extensively under Tulku Urgyen Rinpoche, Nyöshul Khen Rinpoche, and the great scholar Khenpo Rinchen. In 1989 we moved to the United States with our son, Jampal Norbu, and in 1990 Rinpoche began a five-year tenure as the first holder of the World Wisdom Chair at Naropa University. During that time Rinpoche founded Mangala Shri Bhuti, an organization dedicated to establishing a genuine sangha of the Longchen Nyingtik Lineage in the West. Weaving his ancient spiritual heritage with the many threads of a modern Western culture, Rinpoche is known for his uncompromising integrity, deep conviction in altruism, and insistence that all beings can awaken to their own enlightened nature. Kongtrul Rinpoche's life defines what it means to be a spiritual person in modern times. Whether through his teaching, his passion for abstract painting, his steadfast dedication to his lineage and students, or through his joy in solitude, and his unshakable determination to engage his own path, throughout it all, Rinpoche integrates his practice and his life. "Isn’t that the goal of the spiritual path?" Rinpoche often asks. Indeed it is—to be flexible, courageous and exploratory in the face of life’s joys and paradoxes, while never losing touch with a connection to its deepest meaning. Rinpoche is the author of four books: It’s Up to You: The Practice of Self-Reflection on the Buddhist Path; Light Comes Through: Buddhist Teachings on Awakening to our Natural Intelligence; Uncommon Happiness: The Path of the Compassionate Warrior; and The Intelligent Heart: A Guide to the Compassionate Life. Dilgo Khyentse Rinpoche was Kongtrul Rinpoche’s spiritual father and root teacher. An incarnation of the great Rimé, or non-sectarian, master Jamyang Khyentse Wangpo, he is remembered for his scholarship, realization, unceasing warmth and kindness, and his majestic presence. Kongtrul Rinpoche took his teacher’s Sanskrit name, Mangala Shri Bhuti, as the namesake for his organization. I remember vividly my first meeting with the accomplished Tibetan Buddhist teacher Dilgo Khyentse Rinpoche, when I was in my early twenties. He had an impressive history. In his teenage years, driven by his own longing, he left home to practice meditation alone in a cave for many years. 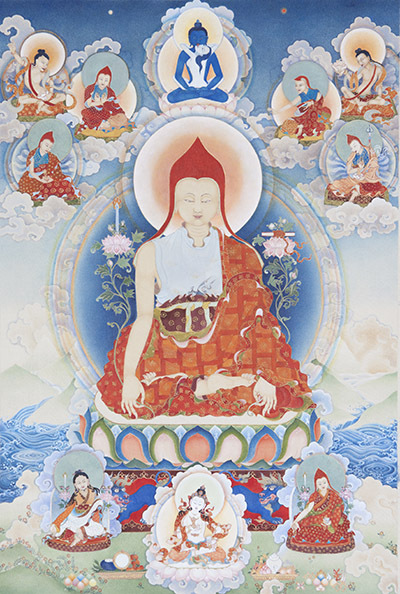 He mastered all the lineages of Tibetan Buddhism—protecting and cherishing each of them according to their unique qualities while emphasizing their essential similarities. He escaped Tibet with his family during the Chinese Cultural Revolution and settled in India. In time he assumed the position of spiritual advisor to the royal family of Bhutan and became the spiritual father of hundreds of young monks whom he tenderly raised in his monastery in Nepal and Tibet. For more information about Dilgo Khyentse Rinpoche, please visit www.shechen.org. I also highly recommend the biography of His Holiness, The Spirit of Tibet, written by his close student Matthieu Ricard. Rinpoche’s first teacher was his mother, Mayum Tsewang Palden, with whom he shared a tender and deeply respectful relationship. She was born in Nangchen, Eastern Tibet, and fled the Cultural Revolution with her husband, Neten Chokling Rinpoche, and her two eldest children to settle in Northern India. There Chokling Rinpoche established one of the first Tibetan refuge settlements in that part of India, as well as the Evam Chogar monastery. Before marrying and having five children (Kongtrul Rinpoche being the youngest), Mayum did sixteen years of solitary retreat in Tibet. She was a fierce and dedicated practitioner and a tremendous example. I only ever remember seeing her practicing. I remember once Kongtrul Rinpoche asked her to dance, and without hesitation she began to move spontaneously and naturally without an ounce of inhibition or self-consciousness. She always seemed to me fearless and free. I feel a special gratitude to Mayum–not only because of her example—but also because of the way she accepted me into the family. Once, when I was a new bride fumbling around trying to fit into my new Tibetan family, she gave me some advice that changed my view of spiritual practice: “You don’t have to be Tibetan and you don’t have to be a Westerner, just know your own mind.” Her words pointed me in the direction of true practice. They took me beyond the foreign cultural forms I was wrestling with and helped me to overcome the complex and naïve ideas I had about spiritual practice. She remains a tremendous inspiration.